Kleefeld on Comics: On Strips: Newspapers without Comics? Robert Harvey recently penned this piece, arguing that newspapers (and, by extension, comic strips) are not nearly as doomed as people often make them out to be. He points out that the main group screaming that the sky is falling on newspapers are newspapers themselves and that, rather than not making money, they're simply not enjoying the huge profits that they used to hold for so long. 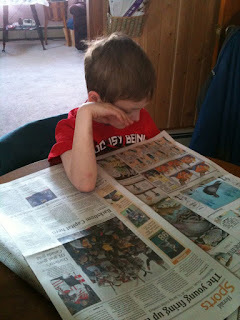 He presents a solid argument for newspapers' overall sustainability. He ties comic strips in by basically saying that it will be cheaper and easier for newspapers to utilize syndicated content than having to generate anything themselves. His reasoning is generally sound except for one thing. There's nothing to guarantee that newspapers will continue to choose comic strips as the syndicated content they want to use. There is plenty of syndicated news available (via sources like the AP) which means that a newspaper can still purchase loads of content that's tied to their (ostensible) primary mission and and the loss of a page or two of comics likely won't harm them. The other point that Harvey doesn't mention is that most syndicated newspaper strips are really webcomics any more. You might be thinking, "Sure, they appear online, but that alone doesn't make them webcomics." What you might not realize, though, is that any syndicated newspaper comic appears online BEFORE they're actually printed up. You can read the day's newspaper strips online right at midnight ET, but they won't actually be available in print form for at least a few hours. Not to mention getting the printed pages from the printer to your doorstep. While people frequently think of webcomics as catering to a very niche audience, compared to the broad base that newspaper comics have, that's not always the case. Many webcomics see huge cross-spectrum audiences. The Oatmeal, for example. How many do you see shared repeatedly through social media? Also pointing to that is that UClick syndicates (electronically) a number of webcomics as well. That suggests that they still feel there's quality material there that's viable for a wide audience, just perhaps not quite as wide a one that Jim Davis has. Indeed, some newspaper strip creators even maintain webcomics as well! Harvey isn't wrong when he's discussing the future of newspapers. And if they continue to carry comics, then his arguments completely fit. I'm just saying that there's nothing to say that newspapers will continue to use comics as a part of their content strategy but, even if they don't, they have potential viability online.